For the academic journal, see Shofar (journal). For the Shofar Organization, see Amnon Yitzhak. A shofar (pron. /ʃoʊˈfɑːr/, from Hebrew: שׁוֹפָר‎ , pronounced [ʃoˈfaʁ]) is an ancient musical horn made of ram's horn, used for Jewish religious purposes. Like the modern bugle, the shofar lacks pitch-altering devices. All pitch control is done by varying the player's embouchure. 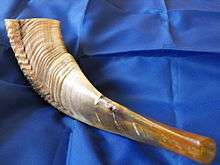 The shofar is blown in synagogue services on Rosh Hashanah and at the very end of Yom Kippur, and is also blown every weekday morning in the month of Elul running up to Rosh Hashanah. Shofars come in a variety of sizes and shapes, depending on the choice of animal and level of finish. 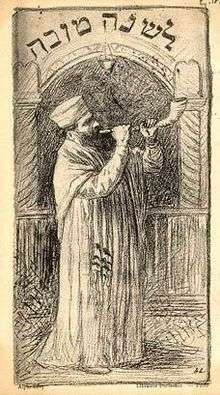 Shofar (by Alphonse Lévy) Caption says: "To a good year"
The shofar is mentioned frequently in the Hebrew Bible, the Talmud and rabbinic literature. The blast of a shofar emanating from the thick cloud on Mount Sinai made the Israelites tremble in awe (Exodus 19:16). The shofar was used to announce holidays (Ps. lxxxi. 4), and the Jubilee year (Lev. 25:9). The first day of the seventh month (Tishrei) is termed "a memorial of blowing" (Lev. 23:24), or "a day of blowing" (Num. 29:1), the shofar. They were for signifying the start of a war (Josh. 6:4; Judges 3:27; 7:16, 20; I Sam. 8:3). Later, it was also employed in processions (II Sam. 6:15; I Chron. 15:28), as musical accompaniment (Ps. 98:6; comp. ib. 47:5) and eventually it was inserted into the temple orchestra by David (Ps. 150:3). Note that the 'trumpets' described in Numbers 10 are a different instrument, described by the Hebrew word 'trumpet' (Hebrew: חצוצרה‎‎; ḥaṣoṣrah), not the word for shofar (Hebrew: שופר‎‎). The Torah describes the first day of the seventh month (1st of Tishrei = Rosh HaShanah) as a zikron teruˁah (Hebrew: זכרון תרועה‎‎; memorial of blowing; Lev. 23:24) and as a yom teruˁah (Hebrew: יום תרועה‎‎; day of blowing; Num. 29). This was interpreted by the Jewish sages as referring to the sounding of the shofar. In the Temple in Jerusalem, the shofar was sometimes used together with the trumpet. On New Year's Day the principal ceremony was conducted with the shofar, which instrument was placed in the center with a trumpet on either side; it was the horn of a wild goat and straight in shape, being ornamented with gold at the mouthpiece. On fast days the principal ceremony was conducted with the trumpets in the center and with a shofar on either side. On those occasions the shofarot were rams' horns curved in shape and ornamented with silver at the mouthpieces. On Yom Kippur of the jubilee year the ceremony was performed with the shofar as on New Year's Day. On Rosh Hashanah and other full holidays (Day of Atonement, Ingathering of the harvest (Sukkot), Passover and the Feast of Weeks – Pentecost) a single Priest perfected two sacrifices in honor of the full holiday, (Note that festivals such as Hanukah and Purim, are not considered full holidays requiring an extra sacrifice). On Rosh Hashanah, something special occurred during the special sacrifice. Arguably two Shofar Sounders played the long notes and one Trumpet player played the short note. Accordingly, Rosh Hashanah is called Yom Teruah (the day of the blast) Otherwise, the Trumpets had "top billing". Rosh Hashanah 27a, supports this claim: "Said Raba or it may have been R. Joshua B. Levi: What is the scriptural warrant for this? – Because it is written, 'With trumpets and the sound of the Shofar shout ye before the King in the Temple, we require trumpets and the sound of the Shofar; elsewhere not.'" Indeed, on Yom Kippur, the Shofar was sounded to announce the Jubilee Year (every 50 years, Jews were granted forgiveness, debts were forgiven, indentured Israelites were granted freedom, and the fields "shall become owned by the priests". 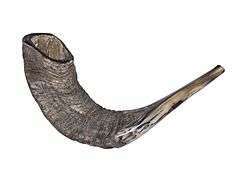 Shofar first indicated in Yovel (Jubilee Year—Lev. 25:8–13). Indeed, in Rosh Hashanah 33b, the sages ask why the Shofar sounded in Jubilee year. Further support is found in Rosh Hashanah 29a, indicating the sounding of both Shofars and trumpets. On Jubilee Year, however, only the Shofar blasts. The Rabbi's created the practice of the Shofar's sounding every Yom Kippur rather than just on the Jubilee Year (once in 50 years). Otherwise, for all other special days, the Shofar is sounded shorter and two special silver Trumpets announced the sacrifice. When the trumpets sound the signal, all the people who were within the sacrifice prostrate themselves, stretching out flat, face down and on the ground. The shofar was blown in the times of Joshua 5 to help him capture Jericho. As they surrounded the walls, the shofar was blown and the Jews were able to capture the city. The shofar was commonly taken out to war so the troops would know when a battle would begin. The person who would blow the shofar would call out to the troops from atop a hill. All of the troops were able to hear the call of the shofar from their position because of its distinct sound. Old Jerusalem Yochanan ben Zakkai synagogue—A flask of oil and a shofar for the anointing of the eagerly-awaited Mashiach. At the inception of the Diaspora, during the short-lived ban on playing musical instruments, the shofar was enhanced in its use, as a sign of mourning for the destruction of the temple. The declaration of the ban's source was in fact set to music itself as the lamentation 'Al Naharoth Bavel' within a few centuries of the ban. (It is noted that a full orchestra played in the temple, the ban was so that this would not be taken for granted, hence the wording of the ban 'if I forget thee O Jerusalem, over my chiefest joy etc.'.) The shofar continues to announce the Jewish Year, and the sighting of the new moon, to introduce Shabbat, to carry out the commandment to sound it on Rosh Hashanah, and to mark the end of the day of fasting on Yom Kippur, once the services have been completed in the evening. Secular uses have been discarded (see a notable exception in a section further down). The shofar is primarily associated with Rosh Hashanah; indeed, Rosh Hashanah is called "Yom Teruah" (or "Yom T'ruah") (the day of the shofar blast). In the Mishnah (book of early rabbinic laws derived from the Torah), a discussion centers on the primacy of the shofar in the time before the destruction of the second temple (70 AD). Indeed, the shofar was the center of the ceremony, with two silver trumpets playing a lesser role. On other solemn holidays, fasts, and new moon celebrations, two silver trumpets were featured, with one shofar playing a lesser role. The shofar is also associated with the jubilee year in which, every fifty years, Jewish law provided for the release of all slaves, land, and debts. The sound of the shofar on Rosh Hashanah announced the jubilee year, and the sound of the shofar on Yom Kippur proclaimed the actual release of financial encumbrances. The halakha (Jewish law) rules that the shofar may not be sounded on Shabbat, due to the potential that the Ba’al Tekiah (shofar sounder) may inadvertently carry it, which is in a class of forbidden Shabbat work. The historical explanation is that, in ancient Israel, the shofar was sounded on Shabbat in the temple located in Jerusalem. After the temple’s destruction, the sounding of the shofar on Shabbat was restricted to the place where the great Sanhedrin (Jewish legislature and court from 400 BCE to 100 C.E.) was located. However, when the Sanhedrin ceased to exist, the sounding of the shofar on Shabbat was discontinued. The shofar says, "Awake, sleepers from your sleep, and slumberers arise from your slumber!" Mishneh Torah, Laws of Repentance 3:4. 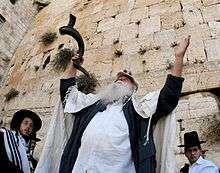 Jewish “Slichot” prayer service with shofar during the Days of Repentance preceding Yom Kippur at the Western Wall in Jerusalem's Old City, 2008. The Sages indicated that the mitzvah was to hear the sounds of the shofar. They went so far as to consider a shofar blown into a pit or cave and to decide whether a person who hears the original sound or the echo has fulfilled the mitzvah. Mishnah (Rosh Hashanah 27b). The Shulchan Aruch sums up that if the hearer hears the reverberation, the mitzvah is not valid. However, if the listener perceives the direct sounds, he fulfils the mitzvah. Thus, most modern halakhic authorities hold that hearing a shofar on the radio or the Internet would not be valid to satisfy the mitzvah because "electronically reproduced sounds do not suffice for mitzvot that require hearing a specific natural sound.... However, one should consult a competent rabbi if an unusually pressing situation arises, as some authorities believe that performing mitzvot through electronically reproduced sound is preferable to not performing them at all." According to Jewish law women and minors are exempt from the commandment of hearing the shofar blown (as is the case with any positive, time-bound commandment), but they are encouraged to attend the ceremony. If the Baal Tekiyah (shofar sounder) blows with the intention that all who hear will perform the mitzvah, then anyone listening—even someone passing by—who intends to hear the Shofar can perform the mitzvah because the community blower blows for everybody. If the listener stands still, it is presumed he intends to hear. If one hears the blast but with no intention of fulfilling the mitzvah, then the mitzvah has not been fulfilled. The expert who blows (or "blasts" or "sounds") the shofar is termed the Tokea (lit. "Blaster") or Ba'al Tekiah (lit. "Master of the Blast"). Being a Ba'al Tekiah (shofar sounder) is an honor. Every male Jew is eligible for this sacred office, providing he is acceptable to the congregation. "The one who blows the shofar on Rosh Hashanah ... should likewise be learned in the Torah and shall be God-fearing; the best man available." If a potential choice will cause dissension, he should withdraw his candidacy, even if the improper person will be chosen. Anyone not obligated to fulfill the mitzvah of sounding the shofar cannot fulfill the commandment for (cover) another whose duty it is to perform the mitzvah. Although a woman (who is exempt from this mitzvah because it is time bound) may not blow the shofar for men (whose duty it is to perform the mitzvah), a female Ba'alat Tekiah may intone the shofar for herself and other women. Similarly, she may say a blessing over the mitzvah even though it is not mandatory (the requisite blessing contains the words "asher kid'shanu b'mitzvotav v'tzivanu", "who sanctified us with His commandments [mitzvot] and commanded us to ...", but women are not commanded in this mitzvah). Only a freeman (not even a slave who will become free in the next month) can be a Ba'al Tekiah. The Ba'al Tekiah shall abstain from anything that may cause ritual contamination for three days prior to Rosh Hashanah. According to the Talmud, a shofar may be made from the horn of any animal from the Bovidae family except that of a cow although a ram is preferable. Bovidae horns are made of a layer of keratin (the same material as human toenails and fingernails) around a core of bone, with a layer of cartilage in between, which can be removed to leave the hollow keratin horn. An antler, on the other hand, is made of solid bone, so an antler cannot be used as a shofar because it cannot be hollowed out. There is no requirement for ritual slaughter (shechita), and theoretically, the horn can come from a non-kosher animal because under most, but not all, interpretations of Jewish law the shofar is not required to be muttar be-fikha (literally: permissible in your mouth); the mitzvah is hearing the shofar, not eating the animal it came from. The shofar falls into the category of tashmishei mitzvah, objects used to perform a mitzvah that do not themselves have inherent holiness. Moreover, because horn is always inedible, it is considered afra be-alma (mere dust) and not an unkosher substance. The Elef Hamagen (586:5) delineates the order of preference: 1) curved ram; 2) curved other sheep; 3) curved other animal; 4) straight—ram or otherwise; 5) non-kosher animal; 6) cow. The first four categories are used with a bracha (blessing), the fifth without a bracha, and the last, not at all. 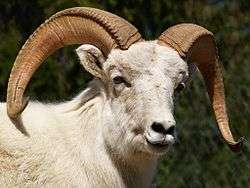 A Dall Sheep with horns. In practice two species are generally used: the Ashkenazi and Sefardi shofar is made from the horn of a domestic ram, while a Yemeni shofar is made from the horn of a kudu. A Moroccan Shofar is a flat Shofar with no curves besides the main curve. A crack or hole in the shofar affecting the sound renders it unfit for ceremonial use. A shofar may not be painted in colors, but it may be carved with artistic designs (Shulkhan Arukh, Orach Chayim, 586, 17). Shofars (especially the Sephardi shofars) are sometimes plated with silver across part of their length for display purposes, although this invalidates them for use in religious practices. The horn is flattened and shaped by the application of heat, which softens it. A hole is made from the tip of the horn to the natural hollow inside. It is played much like a European brass instrument, with the player blowing through the hole, causing the air column inside to vibrate. Sephardi shofars usually have a carved mouthpiece resembling that of a European trumpet or French horn, but smaller. Ashkenazi shofars do not. Because the hollow of the shofar is irregular in shape, the harmonics obtained when playing the instrument can vary: rather than a pure perfect fifth, intervals as narrow as a fourth, or as wide as a sixth may be produced. A small shofar made from a ram’s horn. A shofar made from the horn of a Greater kudu. A small shofar made from a ram's horn. The Tekiah (תקיעה) and teruah (תרועה) sounds mentioned in the Tanakh were respectively bass and treble. The tekiah (or "t'kiah"or "t'qiah") was a plain deep sound ending abruptly; the teruah (or "t'ruah"), a trill between two tekiahs. These two sounds, constituting a single unit of shofar sounding, were rendered three times during a service added specially for Rosh HaShanah: first in honor of God's Kingship (malchiyot or malchuyot)); next to recall the Binding of Isaac, in order to cause the congregation to be remembered before God (zichronot); and a third time to comply with the precept regarding the shofar (shofrot). The word teruah (a broken sound) appears three times in the Bible in the context of the shofar, from which the Talmud derives the rule that three such sounds must be made. In addition, other verses connect the word tekiah (an unbroken sound) to teruah twice, thus leading the Talmud to rule that each teruah must be preceded and followed by a tekiah, leading to a total of nine blasts (tekiah-teruah-tekiah three times). Shevarim (or "sh'varim") (שברים) is composed of three connected short sounds. Teruah is a series of nine very short notes divided into three disconnected or broken sequences of three notes each. The nine notes of the teruah is equal the three notes of the shevarim in duration. Tekiah is slightly longer than the length of either the shevarim or the teruah. Tekiah, teruah, and then a final blast of tekiah gedolah, which means "big tekiah", held as long as possible. This series is also known by its acronyms: TaShRaT, TaShaT, TaRaT, respectively. When blowing the shevarim-teruah, the tekiah is lengthened to be slightly longer than the duration of the shevarim and the teruah together. Some opinions require trebling the series, based on the mention of teruah three times in connection with the seventh month (Lev. xxiii, xxv; Num. xxix), and also on the above-mentioned division of the service into malchiyot, zichronot, and shofarot. Alternatively, although fewer opinions are satisfied, some communities sound a single series of Tashrat-Tashat-Tarat without trebling. This may also fulfill the required total of thirty blasts, if tekiah is counted as one note, shevarim three, and teruah nine. Regardless, all halachic authorities teach that one should follow one's community's custom. Shofar sound for Rosh Hashana, Ashkenaz version; The National Library of Israel. It is customary to hear 100 or 101 sounds in the synagogue, although the minimum requirement is to hear 30 sounds. The shofar is sounded just before, during and after the Musaf prayer on Rosh HaShanah. For the sounding just before Musaf, after the Torah reading, relevant verses from the Bible are recited, followed by two blessings: one on the Biblical commandment of "hearing the sound of the shofar" and the blessing of Shehecheyanu. After that, thirty shofar blasts are sounded. In the Musaf prayer itself, the shofar is sounded three times during the silent prayer, and then again three times during the leader's repetition. For each of these soundings, ten appropriate selections from the Bible are recited, followed by a benediction, followed finally by a series of ten shofar blasts. After leader's repetition of the Musaf prayer is completed, a final series of ten (or eleven, depending on the community's custom) shofar blasts are sounded, yielding a total of 100 or 101 blasts. (Some communities do not blow the shofar during the silent Musaf prayer, instead blowing the 30 blasts after the leader's repetition.) After the service is over, it is customary to blow another series of thirty blasts "to confuse the Adversary". According to the Sephardic tradition, a full 101 blasts are sounded, corresponding to the 100 cries of the mother of Sisera, the captain of Jabin's army who did not return home after being killed by Yael (Judges 5:28). One cry is added to symbolize the legitimate love of a mother mourning her son. The shofar is used mainly on Rosh Hashanah and Yom Kippur. It is blown in synagogues to mark the end of the fast at Yom Kippur, and blown at four particular occasions in the prayers on Rosh Hashanah. Because of its inherent ties to the Days of Repentance and the inspiration that comes along with hearing its piercing blasts, the shofar is also blown after morning services for the entire month of Elul, the last month of the Jewish civil year and the sixth of the Jewish ecclesiastical year. It is not blown on the last day of month, however, to mark the difference between the voluntary blasts of the month and the mandatory blasts of the holiday. Shofar blasts are also used during penitential rituals such as Yom Kippur Katan and optional prayer services called during times of communal distress. The exact modes of sounding can vary from location to location. In an effort to improve the skills of shofar blowers, an International Day of Shofar Study is observed on Rosh Chodesh Elul, the start of the month preceding Rosh Hashanah. A Jewish Haredi man blowing a Shofar, 2012. Hasidic Jew, blowing the kudu shofar in Uman, Ukraine, 2010. During the Ottoman and the British rule of Jerusalem, Jews were not allowed to sound the shofar at the Western Wall. After the Six Day War, Rabbi Shlomo Goren famously approached the Wall and sounded the shofar. This fact inspired Naomi Shemer to add an additional line to her song Jerusalem of Gold, saying: "a shofar calls out from the Temple Mount in the Old City." In pop music, the shofar is used by the Israeli Oriental metal band Salem in their adaptation of "Al Taster" psalm. The late trumpeter Lester Bowie played a shofar with the Art Ensemble of Chicago. In the film version of the musical Godspell, the first act opens with cast member David Haskell blowing the shofar. In his performances, Israeli composer and singer Shlomo Gronich uses the shofar to produce a very wide range of notes. Since 1988 Rome-based American composer Alvin Curran's project Shofar features the shofar as a virtuoso solo instrument and in combination with sets of natural and electronic sounds. In Jerry Goldsmith's scores to the film Alien and Planet of the Apes, the shofar is part of the orchestration. Madonna used a shofar played by Yitzhak Sinwani on the Confessions Tour and the album Confessions on a Dance Floor for the song "Isaac", based on Im Nin'alu. In 2003, The Howard Stern Show featured a contest called "Blow The Shofar", which asked callers to correctly identify popular songs played on the shofar. The shofar is sometimes used in Western classical music. Edward Elgar's oratorio The Apostles includes the sound of a shofar blowing, although other instruments, such as the flugelhorn, are usually used instead. Shlomo Bar, Entertainment; Shofar blown in Israeli Pop music, 2009. The Shofar has been sounded as a sign of victory and celebration on May 8, 1945. 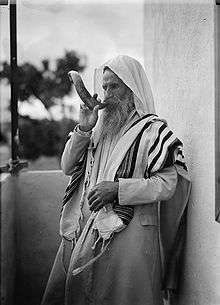 Jewish elders were photographed blowing multiple shofars after hearing that the Nazi surrendered. The Shofar has played a major role in the pro-Israel movement and often played in the salute to Israel parade as well as other pro-Israel demonstrations. Protester blowing the Shofar at demonstration for Israel in Prague, 2009. ↑ "Jewish prayer-book". Cambridge Digital Library. Retrieved 25 September 2014. ↑ It has been said that when the mashiach comes, the Sephardic community will be ready to anoint him and blow the shofar to announce his arrival. 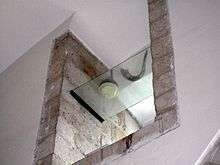 Legend has it there is a tunnel from under the Yohanan Ben Zakkai synagogue that leads directly to the Temple Mount. ↑ Judith Kaplan Eisenstein, Heritage of Music, New York: UAHC, 1972, pp. 44–45. ↑ "Anticipation and Consummation: a Perspective on the Shofar" (PDF). ↑ Navon, Mois (2001). "The Ḥillazon and the Principle of "Muttar be-Fikha"" (PDF). The Torah u-Madda Journal. 10/2001: 142–162. Retrieved 15 June 2016. see pages 147-148 ff. ↑ "Shofar-Call to Action". Chabad. Retrieved 6 November 2011. ↑ Kitzur Shulchan Aruch 129:17, et seq. ↑ Kitov, Eliyahu. "One Hundred Sounds". Chabad.org. Retrieved 6 November 2011. Hearing Shofar: The Still Small Voice of the Ram's Horn by Michael T. Chusid, a three volume compendium of shofar information. Chisholm, Hugh, ed. (1911). "Shofar". Encyclopædia Britannica (11th ed.). Cambridge University Press. Shulkhan Arukh limited English translation includes Rosh Hashanah chapters 585–590 regarding the shofar.